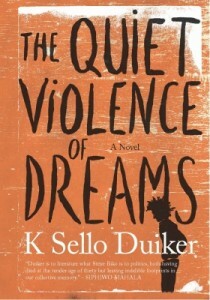 For my birthday last year, a good friend of mine gave me K Sello Duiker’s The Quiet Violence of Dreams. I had never read the book and my friend insisted that I read it, so he bought it for me. I often like to relate how books come to me because the journey of the book into my tiny library is often telling about the book itself. So there is a story about the book before I even get to the story in the book. Just before I started reading this book, I saw it was listed on “100 African reads” and so I was excited to start reading it. The tittle is captivating, The Quiet Violence of Dreams, and it absolutely captures the essence of K Sello Duiker’s work. Mental health is one of the least talked about issue in black South African communities, and this book places it centre stage. Growing up people with mental illness were often referred to as people who were bewitched, and often they received no real treatment. Even today people with metal illness roam the streets of South African townships without any real medical assistance. This book shows up how people without mental illness are so ill equipped to deal with people who have mental illness. Tshepo is spot on here about the unpredictability of life and how only so much is up to us and the rest we are left at the whims of the universe (whatever form the universe is represented in your life). The unpredictability of life and options being left to chance is revealed later in the book when we learn about the traumatic incident that Tshepo went through when he was a child living at home and the subsequent troubled relationship he has with his father. I am always in favour of stories depicting black men falling in love with other black men. It’s a narrative that is lacking in South African literature and it’s always such a pleasure to read such stories. Many have lamented that black men loving other black men is a revolutionary act, and I am inclined to agree. One of the striking characteristics about Tshepo is how he lies to everyone. Almost everything in his life is concealed from the people who are his friends and acquaintances. I suppose he feels he can’t trust anyone with the truth, his truth, and so he is compelled to lie even about small things that do not really necessitate lying. This made me think of the culture of lying in this country and how pervasive it is, from the highest people in government to lay people on the streets. Even when telling the truth will not cause damage or embarrassment, people choose to lie. K Sello Duiker really captures the intersection of race, class, sexuality that permeate South African’s experiences in this marvellous novel. He captures the hardness of South African society and the violent nature of restricting people’s identities and choices. He particularly captures the hardships that even “larney” middle class black people experience navigating the die-hard beliefs and stereotypes about blacks from apartheid years. Towards the end of the book, the protagonist Tshepo says, “perhaps I sense that I will die young…. Death is begging at my heels in my dreams.” This is poignant only because K Sello Duiker committed suicide in 2005, and reading this book I was struck by the “life imitating art” sense of that passage. In that sense I can’t but agree with Siphiwo Mahala who described K Sello Duiker saying “Duiker is to literature what Steve Biko was to politics, both having died at the tender age of thirty but leaving indelible footprints in our collective memory.” And I would add, although under different circumstances, both of them somewhat professed their deaths. What I take from this novel and what this novel represents for me is captured in the interaction between Tshepo and West after making love for the first time and going for a swim after. West says to Tshepo as they lie in the dark in different beds in the same room somewhere in Stellenbosch “you must go where love leads you, even when you are going towards trouble.” Imagine a South Africa where we all did that.